SKU: SKU18249. Categories: Bean To Cup, Bean to Cup Coffee Machines, Bean to Cup Machines With Fresh Milk, Coffee Machines, Commercial Coffee Machines, Macco Bean to Cup Machines, Office Coffee Machines. The drink selections, background colours and images can be easily customized on the display; you can load screensavers and promotions to maximize the benefits associated with a great beverage offer. The integrated loudspeaker allows you to play music and promotions which is complemented by the clear step-by-step graphical instructions of how to set and operate the machine. 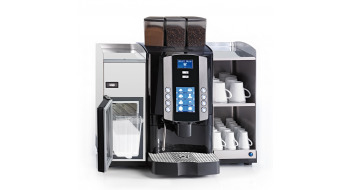 Available also in self serve configuration: This coffee machine is ideal for Office Coffee Service and communities.